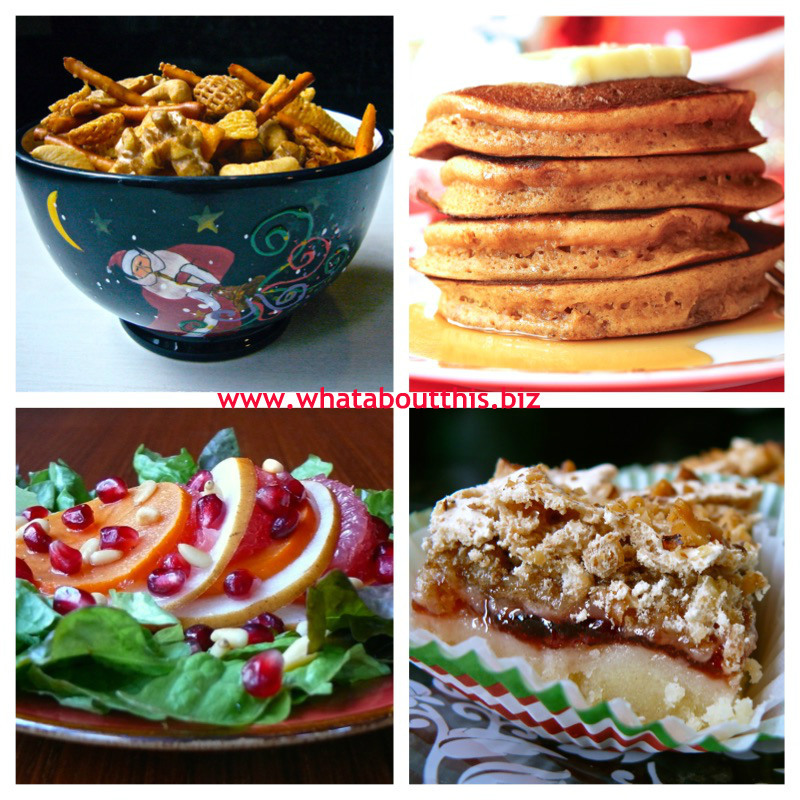 healthy salads | What about this? 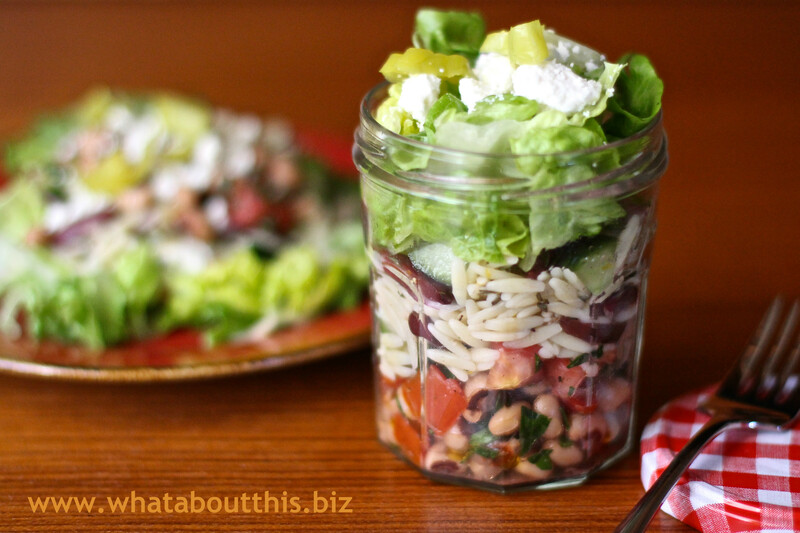 Part green salad and part pasta salad, but all parts delicious and fresh! Pair this Italian-influenced salad with rustic artisan bread for a quick and healthy meatless supper or throw it together for easy entertaining. 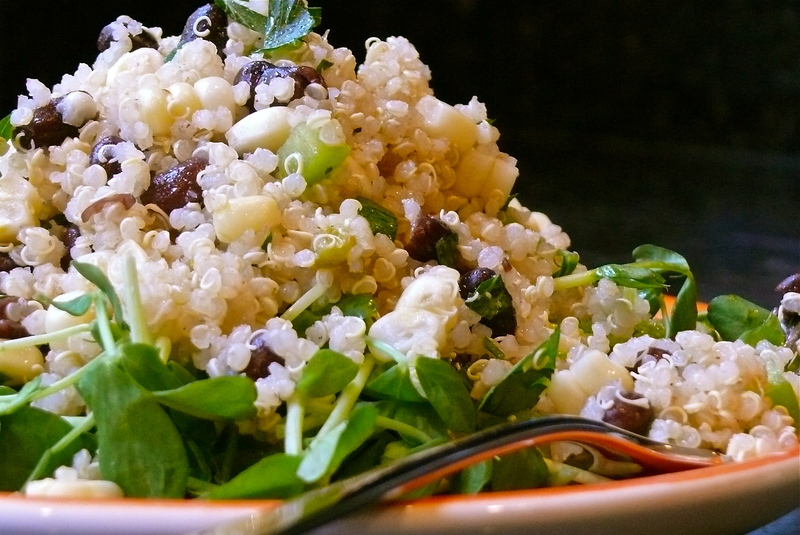 With only nine simple ingredients, this salad is big on taste and big on convenience. Combine first 8 ingredients in a large bowl, and toss well. Sprinkle with freshly ground black pepper, if desired. 1. 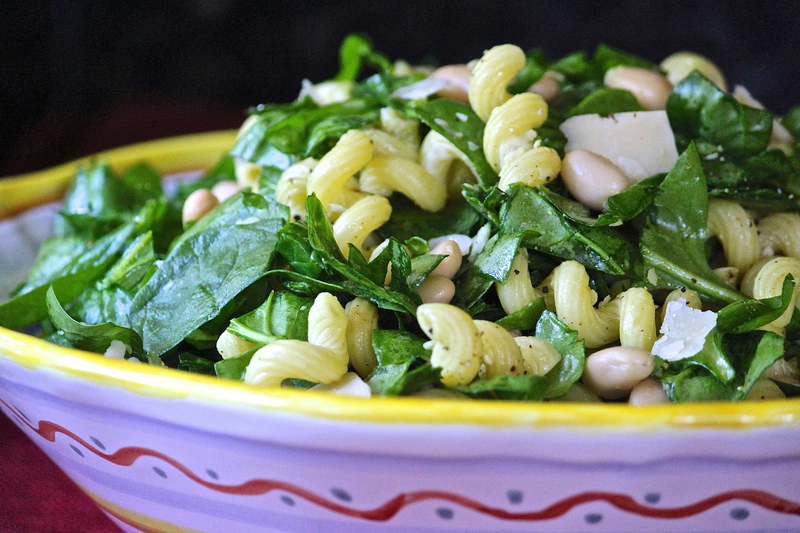 Cavatappi is also known as cellentani, spirali or tortiglione. 2. Maybe I packed too much chopped spinach into each cup while measuring it out, but this made much more than 4 servings. 3. I thinly shaved the Asiago instead of shredding it. Update (6/24/13): I made this salad again, but with some substitutions and additions. I used cavatelli instead of cavatappi and replaced the regular olive oil with Meyer lemon infused olive oil. Cherry tomatoes, fresh off the vine, were sliced in half and added to the salad along with some toasted pine nuts. Very nice! Feeling guilty over devouring a two-pound lobster last night in celebration of my 35th wedding anniversary, tonight I’m eating a healthy quinoa and black bean salad that’s tossed with a lime-cumin dressing and served on a bed of fresh pea shoots. 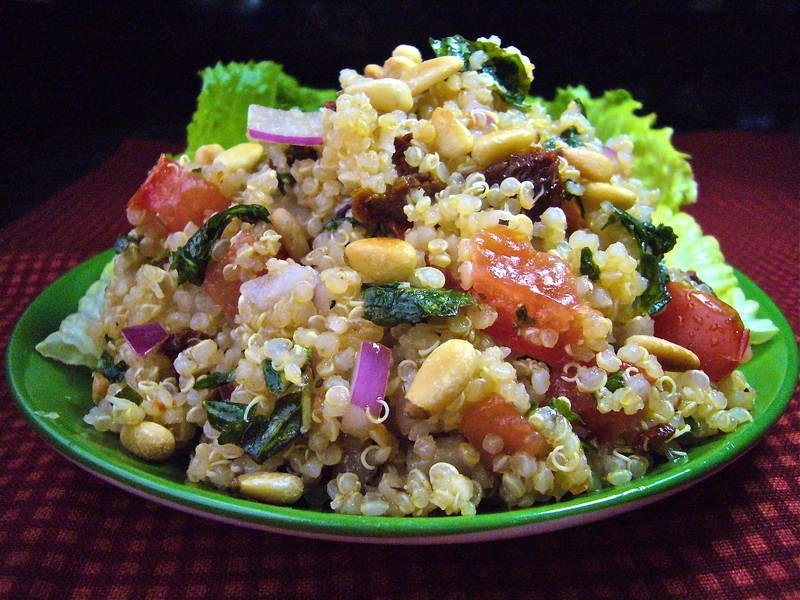 I’ve posted other quinoa recipes before, so you already know that these grains are amazingly-nutritious. Adding the delicate pea shoots provides a rich source of Vitamins K, C, and A. What a delicious way to offset the gluttony of the evening before! 1. In a bowl wash quinoa in at least 5 changes cold water, rubbing grains and letting them settle before pouring off most of water, until water runs clear and drain in a large fine sieve. 2. In a saucepan of salted boiling water cook quinoa 10 minutes. Drain quinoa in sieve and rinse under cold water. Set sieve over a saucepan of boiling water (quinoa should not touch water) and steam quinoa, covered with a kitchen towel and lid, until fluffy and dry, about 10 minutes (check water level in saucepan occasionally, adding water if necessary). 3. While quinoa is cooking, in a small bowl toss beans with vinegar and salt and pepper to taste. 4. 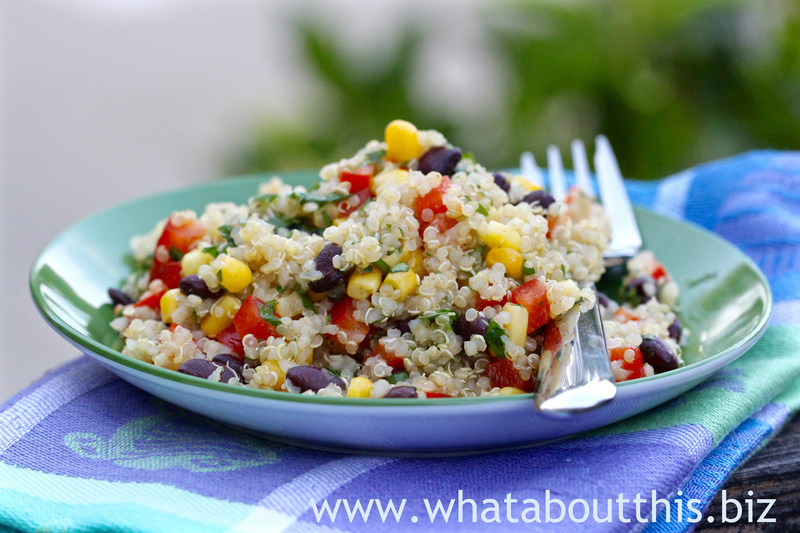 Transfer quinoa to a large bowl and cool. Add beans, corn, bell pepper, jalapeños, and coriander. Toss well. 5. In a small bowl whisk together lime juice, salt, and cumin and add oil in a stream, whisking. 6. 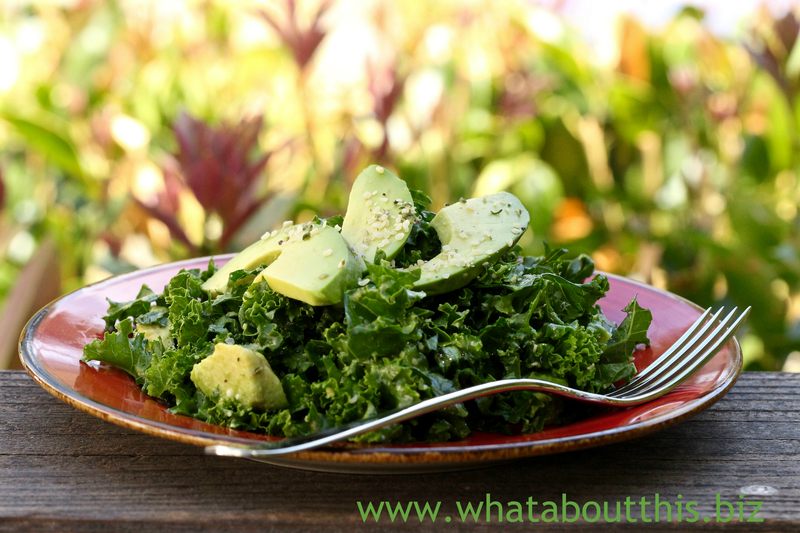 Drizzle dressing over salad and toss well with salt and pepper to taste. Salad may be made 1 day ahead and chilled, covered. Bring salad to room temperature before serving. Serves 4 to 6 as an entrée or 8 as a side dish. 1. Fresh jalapeño can be used instead of pickled jalapeño. 3. Because I had fresh lemons and didn’t have fresh limes, I substituted 5 tablespoons of lemon juice for the lime juice. With that substitution, I decided to use Meyer lemon-infused olive oil in lieu of regular olive oil. 4. Another successful substitution was Italian parsley for the coriander leaves. I’m sure the recipe would have had a more southwestern flavor, if I had used lime juice and coriander leaves. My version had a bit more of an Italian flare. 5. I used less salt than the recipe called for. I did not add any salt to the bean and vinegar mixture and I only put in a pinch of salt into the dressing mixture.